Hiking Shenandoah National Park, 4th ed. ©Bert Gildart: More than 500 miles of trails wander through Shenandoah National Park, and knowing where to start can be difficult. Our 6×9 inch guide is intended to help you select from 59 trails based on your abilities and interests. With a new collection of almost 90 color images our 232 page book is also intended to inspire readers to make a trip to this wonderful national park. To some extent it seems all trails in the park either ascend or descend, but not every trail is steep or rocky, and the park offers something to suit all interests. Some trails lead to the park’s 16-plus waterfalls, while others lead to panoramic and dramatic overlooks. 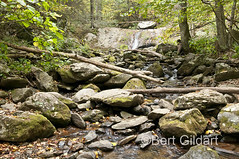 The famous Appalachian National Scenic Trail (AT) is a major route through Shenandoah. 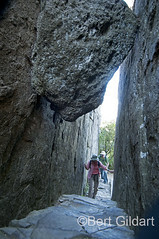 Yet another trail ascends to the summit of Old Rag where you’ll find boulders ancient beyond belief. Scrambling over billion year old boulders is just one of the remarkable adventures you can find in Shenandoah National Park. As well, you’ll hike in the shadow the park’s early settlers and see their old cabins. You’ll look down on the site of a Civil War battlefield, see old waterwheels, grinding stones and beautiful stone walls built when space was cleared for farmland. With the hopes that more visitors will want to enjoy the pleasures of exploring this premier national park we’ve now spent almost 12 months in all seasons observing park life and hiking nearly all the trails in the park. We often found that the aesthetics of Shenandoah’s incredible natural history, as well as its human history, provide compelling reasons to hike these trails. We share the wonder of all that we have discovered in Hiking Shenandoah National Park. Hiking Shenandoah contains 59 hikes, each of which is illustrated with a map and an elevation graph, meaning 59 maps and 59 elevation graphs. 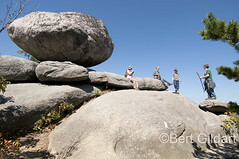 As well, there is a color photo for nearly every hike. There is a detailed index and it breaks hikes into seven categories, such as: kid friendly hikes, hikes to waterfalls and hikes with great views. 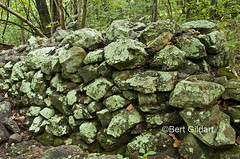 Each hike has substantial text and Hiking Shenandoah provides details about the history and natural history of each trail. Photographic opportunities abound, and new images suggest creative opportunities. 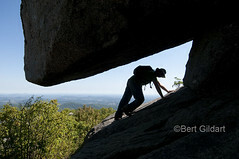 At 3,268 feet Old Rag is not the highest mountain in Shenandoah National Park (Hawksbill Summit, 4,015 feet, has that distinction), but it is without question the park’s most challenging and exciting mountain to climb. For one thing the rock is ancient almost beyond belief, meaning that although you can say “over a billion year’s old,” such a time frame has little meaning. Naturalists try to add a sense of relativity by reducing such an expanse to human longevity or human history. They say that if the Blue Ridge Mountains represented an event that occurred 12 hours ago then all the time that has elapsed since the birth of Christ would be less than a tenth of a second. 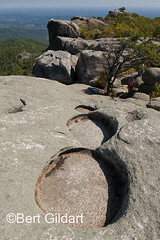 Using various scientific instruments to substantiate theory geologists say rocks atop Old Rag began their formation when the continents of North America, South America, India, Australia and Antarctica collided to form a super continent called Rodinia. These collisions, which occurred over a billion years ago, created immense forces, which acted on the massive plates on which these continents float, forcing them to buckle. The huge “Grenville Mountains” formed and they equaled today’s Rockies in size and in length, spanning a distance equal to traveling from Mexico to Canada. Concurrent with the orogeny, magma formed deep within the crust, but over the eons eventually made its way to the surface, crystallizing as today’s Old Rag Granite. TESTIMONIALS: This book sale with Paypal is a new for me, started 11/11/2012. However, testimonials for Shenandoah will soon be coming, or so we’ve been told. Suffice it to say for the time being that this is the park’s featured hiking guide. You can buy the guide book right here, from the authors. We’ll send it to you by USPS, and we’ll even autograph it for you with your choice of inscription. We use PayPal to process orders. You don’t need to have a PayPal account, you can use any credit card, and the merchant (Bert and Janie) never sees your card number. And PayPal is very secure. We truly hope you will visit Shenandoah National Park and that you will let our book be your hiking guide. Trail Finder for best hikes with dogs, children, hikes with great views, etc. Get an autographed copy of Hiking Shenandoah, 4th Ed. This entry was posted on Thursday, November 15th, 2012 at 1:28 pm and is filed under Books & Stories, Natural History/Conservation, RV Travel, Travel. You can follow any responses to this entry through the RSS 2.0 feed. You can leave a response, or trackback from your own site.